It’s possible to produce food without poisoning people and the planet. Examples of fair and sustainable ways of farming and producing food, agro-ecology, already exist in Europe. They keep ecosystems in balance, respect wildlife, preserve soil, water and other natural resources, reduce greenhouse gas emissions, and provide high quality, healthy, local and seasonal food with conventional and organic seeds and livestock breeds. These sustainable alternatives are gaining more and more support as the failings of the current industrial methods become clearer; endless food scandals, the spread of monocultures damaging landscapes, and the loss of nature as well as small-scale farms. A movement is building towards local production and consumption, moving away from the industrial agribusiness giants and their intensive and damaging methods of food production. Seeds are fundamental to our food chain. In the past farmers exchanged their seeds and saved part of their previous harvest to sow the next. They constantly improved seed and adapted it to the diversity of soils, climates conditions, as well as to the community’s needs. Farmers’ seeds gave us the diversity of crops and varieties we cultivate today on European fields. Industrial and GM seeds, on the other hand, serve only the financial interests of the companies that produce them. The seeds are patented and covered by intellectual property rights. They often require large quantities of chemicals in order to deliver high yields – driving sales of pesticides, often produced by the same companies that produce the seed, locking farmers into a cycle of dependency. Farmers and citizens in Europe are beginning to recapture the skill of breeding their own seeds, and are launching campaigns to defend farm-grown seeds, to develop participatory methods able to conserve many varieties, and improve seed diversity. Seed networks and local seed-exchange fairs are being set up, and knowledge on the selection of seeds is now being exchanged across Europe. Instead of patented seed systems these solutions are based on a participatory approach, where exchange of knowledge is key. In contrast to the ever growing supermarkets and the increasing corporate control of the whole food chain, there has been a renaissance in locally produced, agro-ecological food across many countries. These have led to more and better jobs, including young people, and a more vibrant rural economy. GM-crops go hand-in-hand with large industrial monocultures. Fields and fields of the same crops. This is bad for wildlife, bad for environment and climate change. Smaller fields, biodiversity-rich hedgerows, increased crop rotation and many other techniques can be used to create a healthier countryside. In addition, tens of thousands of people have been taking to the streets across Europe, demanding GM free and sustainable farming, a healthy environment and an end to industrial agriculture and factory farms. A real movement for change is happening – a real movement based on food sovereignty and challenging the corporate control of food and farming. University of Canterbury researchers have found that the biotechnologies used in north American staple crop production are lowering yields and increasing pesticide use compared to western Europe. A conspicuous difference is the adoption of genetically modified/engineered (GM) seed in North America, and the use of non-GM seed in Europe. "We found that the combination of non-GM seed and management practices used by western Europe is increasing corn yields faster than the use of the GM-led packages chosen by the US." 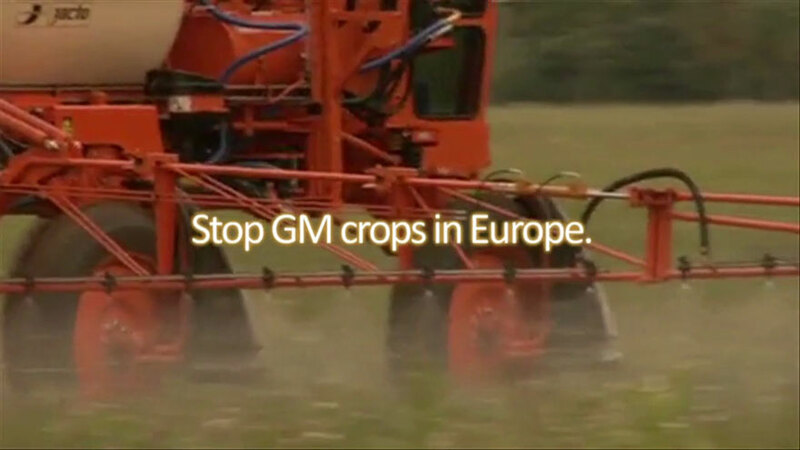 Continue reading >> "Researcher says GM a failing biotechnology "
The European Commission is currently considering reviving talks on 25 new GM-crops for cultivation in Europe – including crops resistant to the pesticide RoundUp and insecticide-producing varieties of GM maize, soybean and sugarbeet. The groups claim that such a move would drastically change farming in Europe, leading to a big increase in pesticide use, contamination of conventional and organic crops and further industrialisation of the countryside. Continue reading >> "European farming at risk"
Project to increase cooperation between agriculture and nature conservation by hundreds of farmers that are working together to increase beneficial biodiversity.